Thumbs offers one of the most simple survey experiences possible. As a classic gesture, Thumbs is super intuitive. Two thumbs - one pointed downward, the other pointed upward. If it's a "Thumbs Up" - the feedback is positive. If it's a "Thumbs Down" - the feedback is negative. It's really that simple! Consider you're watching one of your favorite TV series. Not only that, but this is your favorite episode - the one where you can't stop laughing for 30 minutes straight. After the final joke drops, the credits start rolling, and you're prompted with the question: "What did you think about this episode" with a Thumbs Up / Thumbs Down survey just below. Pretty easy choice, isn't it? Thumbs Up! Thumbs distills feedback to just two options - allowing respondents to make split-second decisions just like those we mentioned above. Even more importantly, Thumbs provides an easily scalable and actionable collection of customer data. With just two bodies of data (Thumbs Up and Thumbs Down) that a team needs to track over time, more and more team members can view the feedback at a glance and gain immediate insight. For Thumbs, respondents provide a score on a scale of: Thumbs Up or Thumbs Down. 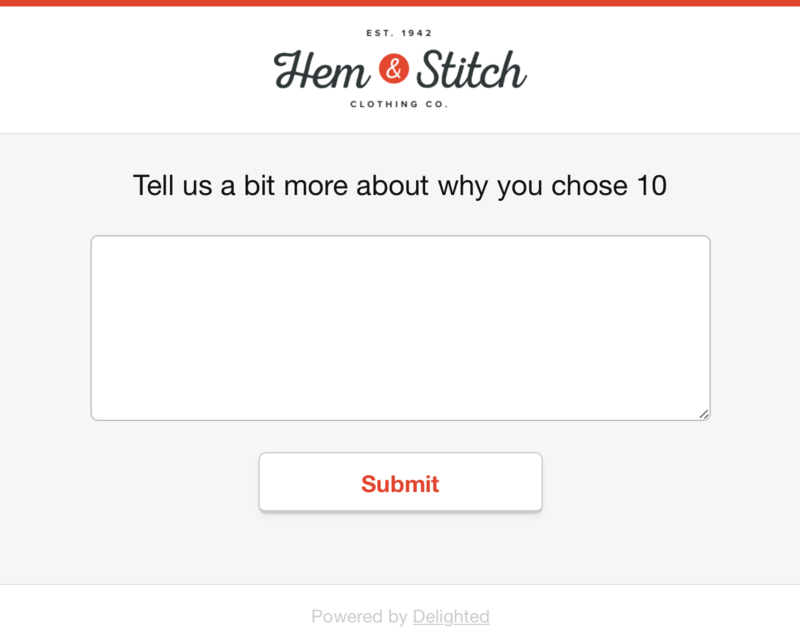 After providing a score, respondents go on to provide an open-ended response, and then land on a Thank You page that you can customize. At a glance, the Thumbs-related metric displayed above is more clearly inclined one way (less time required to understand gradients on the scale), enabling any team to act more swiftly on that feedback. Whether focusing on the end-user experience, or examining the ease of reporting/closing the loop, the power of simplicity is what underpins Thumbs and sets it apart from other survey methods.